The island of Patmos - Πάτμος and its neighbours form an ideal tranquil yacht charter area, close to charter bases in Kos or Samos. Patmos forms - together with the smaller islands Lipso, Arki, Agathonisi and Farmakonisi - the most northern group of islands in the Dodecanese, and is a rugged island of volcanic origin - perhaps the rim of an ancient caldera. It has been celebrated since the Middle Ages as the island of St John the Divine, who is said to have written the Book of Revelation while living in exile on Patmos. 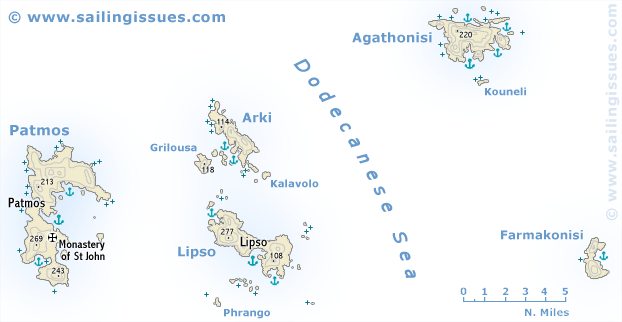 Agathonisi, also called Gaidharos, was in Roman times the island of Tragia, where the young Ceasar was captured by pirates in 76 BCE. It has neither sandy beaches nor ancient monuments to attract visitors and is therefore untouched by the tourist trade. The island of Farmakonisi is less barren and has gentle green slopes. There are remains of a number of Roman villas and the ancient harbour, now partly under the sea. Patmos was originally settled by Dorians and later by Ionians, and had a Sanctuary of Artemis. The early history of the island, a place of little or no political or economic importance, is unknown. Like its mostly barren neighbouring islands, Patmos was used as a place of exile in Roman times. During the early Middle Ages it seems to have been abandoned and desolate. 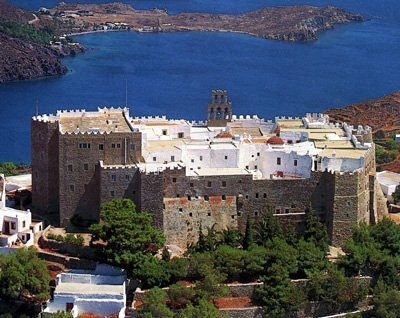 Since 1946 the whole island of Patmos has been under statutory protection as an ancient monument. The acquisition of land by foreigners and the export of antiquities are prohi­bited. The monastery of St John fortified within its massive 15th century walls. 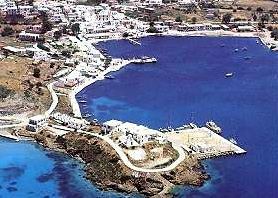 Aerial view of Patmos town (Skala or Khora) looking north. 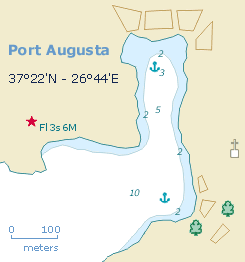 Port Augusta on the island of Arki is reached through a narrow inlet (10-5 m deep). Although the light on the north side of the entrance is easily identified a night approach is not advised since a reef extends from the north entrance (15 m long max). Anchor in the bend (6 m, mud) or take a line ashore next to the tavernas and enjoy the attractive surroundings. Much of the land on Lipsi was owned by the Monastery of St. John, the Baptist, on Patmos. Today, you can see small, white, blue domed churches dotted all over the island's rolling hills, which gently slope down to meet the sparkling Aegean Sea. Lipsi's coastline consists of a number of small bays, sheltered coves and beaches with shallow, crystal clear waters.